The Basic Configurion includes 48K of Static RAM, two serial ports, disk controller pair, and custom front panel interface. Additional configurations are included that add more memory, PROM monitors and Boot PROMS. 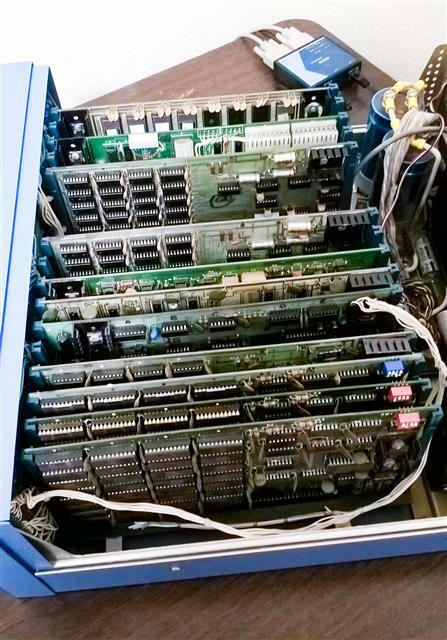 The 64K Configuration adds two boards to the Basic Configuration. The Turnkey Module includes a third serial port, UBMON Monitor PROM, and DBL Boot PROM. The 64K configuration with dual drive makes this system functionally equivalent to a MITS 300/25 Business System. The 64K configuration is the preferred configuration because it can run the Altair Accounting Software, uses less boards, and produces less heat. The 60K Configuration has powerful the ALTMON Monitor PROMs and allows various configurations of the top 4K of memory. The 60K Configuration uses more boards, and produces more heat. e 60K Configuration uses more boards, and produces more heat. The 60K Configuration uses more boards, and produces more heat. The GW312 connects the Console and Communication RS-232 Serial Ports to an Ethernet network. The serial ports can be accessed by Telnet or a terminal program on a PC.